SHACKLED to a 12-of-32 shooting performance in Game 4, Derrick Rose bounced fabulously well in Tuesday night's Game 5 of the Eastern Conference semifinals, leading his Bulls to a 95-83 win over the Atlanta Hawks. Playing with an angry, bleeding heart, Rose dropped 33 points against the Hawks. The just-crowned MVP sank 11 of 24 field goals, 10 of 13 free throws and grabbed a pair of rebounds in 42 spirited minutes of play. Rose did show signs of being human, hitting only 1-for-5 beyond the arc and turning the ball over twice. But the minor flaws did not make him stoppable. The Hawks pursued him all night, but D-Rose was as elusive as a fugitive from justice, twisting and turning, passing and leaping. Watching Rose elude the Hawks was like watching a hopeless, helpless man chase a Ferrari with cowboy boots on. "It's definitely fun playing a good team," a relieved Rose said during the postgame press conference. D-Rose treated the Hawks defense like an all-you-can-eat buffet. He feasted on the one-on-one coverage thrown at him early, and when the Hawks switched to double, triple, and sometimes multiple team coverages, Rose quickly found the open teammate and finished with nine assists. Toiling in the warmth of a friendly United Center home crowd, Rose found plenty of help, a sharp contrast to the Bulls' 100-88 Game 4 debacle in Atlanta. LUOL DENG resurfaced from a mild shooting coma and promptly drilled 23. 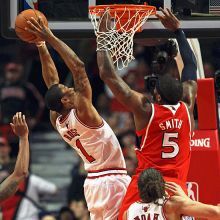 He tallied the Bulls' first seven points in the opening quarter, which paved the way for Chicago's early 32-17 bulge. Deng also had four rebounds and three assists. Keith Bogans returned from an ankle injury and went semi-berserk from 3-point land, hitting 3-of-5 treys to finish with 11 points. Joakim Noah had a rare night off -- zero points and six rebounds in 27 minutes of action -- but Taj Gibson picked up the slack with 11 points. Gibson sprang from the bench and seamlessly assumed Noah's "energy guy" role, filling the stats sheet with two rebounds, two assists and a shotblock. Heck, even Carlos Boozer got in the picture. The oft-injured, overpaid power forward chipped in 11 points and 12 rebounds, muting some of the boos that have pelted him many a times at the United Center this postseason. The Bulls now lead this best-of-7 showdown 3-2 with the series shifting back to the Philips Arena for Game 6 Thursday night. ALTHOUGH the final score revealed a double-digit margin, Game 5 was fought much closer than it appeared. Unfazed by a 15-point deficit, the resilient Hakws kept plugging in, making small strides here and there before closing in at 48-42 at the half. After an up-and-down, helter-skelter third quarter, the Hawks finally took a brief 70-69 advantage with 11:18 left in the fourth quarter. But like a streak of white lightning on a dark gray sky, the Hawks lead vanished quickly. Tired of chasing their rivals all night, the Hawks had little resistance left as the Bulls powered through the final 12 minutes with a 26-15 spurt. Jefff Teague paced the Hawks with 21 points on 8-for-11 shooting from the field. The sophomore point guard also dished seven assists. The Hawks would need more of his heroics to force a deciding Game 7.